NYTimes: ''Gattaca,'' an impressively fine-tuned first feature from Andrew Niccol, has been cleverly marketed for weeks with advertisements offering genetically select babies, slick images that fit all too smoothly into today's culture of perfectionist striving. The film is set in ''the not-too-distant future,'' and indeed it succeeds as a scarily apt extension of present-day attitudes. Despite all of his disadvantages—which are only magnified by the near-perfect people who occupy his world—Vincent refuses to allow science to control his destiny. He refuses to believe that there isn’t more to who he is than what can be learned from genetics testing. Vincent has a dream to work at Gattaca Aerospace Corporation and become a navigator on a manned trip to Titan. Vincent’s biology says he can’t make that kind of trip, not to mention hold such an esteemed position; but Vincent’s willpower—his soul, his spirit, whatever you want to call it—says otherwise. Entertainment Weekly: The queasiest notion at the heart of Gattaca (Columbia) is that our bodies betray us a thousand times a day, shedding flakes of skin and hair that each contain our DNA — a nimbus of presence — wherever we go. In the movie’s sterile near future, a woman can casually kiss a lover, have her lip swabbed at the corner gene-testing booth, and find out his breeding potential. And the police don’t dust for fingerprints — they vacuum the entire building. Salon: It's obvious that the "burden of perfection" has spoiled these people -- but no one in "Gattaca" besides Vincent seems to have caught on. The film plainly aspires to serious insights into human nature -- how our strengths are woven in with our imperfections in an intricate double helix of the spirit. But it doesn't let most of its characters get to square one in the psychological drama. When they sculpted the DNA for the perfect race in "Gattaca," somebody left out the gene for self-knowledge. SFChronicle: But even on its own terms, "Gattaca" falls short. Niccol has presented a future world based on genetics, but he's concentrated only on physical attributes. Wouldn't a future meritocracy be more interested in brain power rather than in people's likelihood of keeling over from a heart attack at a young age? And wouldn't such a future world be that much more dangerous and tyrannical -- yet, in a strange way, justifiable? Roger Ebert: Science fiction in the movies has recently specialized in alien invasions, but the best of the genre deals with ideas. At a time when we read about cloned sheep and tomatoes crossed with fish, the science in “Gattaca” is theoretically possible. When parents can order “perfect” babies, will they? Would you take your chances on a throw of the genetic dice, or order up the make and model you wanted? How many people are prepared to buy a car at random from the universe of all available cars? That's how many, I suspect, would opt to have natural children. Everybody will live longer, look better and be healthier in the Gattacan world. But will it be as much fun? Will parents order children who are rebellious, ungainly, eccentric, creative, or a lot smarter than their parents are? There's a concert pianist in “Gattaca” who has 12 fingers. Don't you sometimes have the feeling you were born just in time? AV Club: Ambitious science-fiction films tend to age two ways: like fine wine, or like chicken salad left out in the sun. In that respect, history has been kind to Gattaca, Andrew Niccol's 1997 writing and directing debut. Eleven years later, genetic engineering remains a hot topic, and the film's fussy production design remains classic yet timeless, with its chilly grays, blacks, and blues, heavenly sunburst golds, and sleek, metallic surfaces lacking even the faintest trace of human warmth. It's a world borrowed largely from previous science-fiction classics, an icy, minimalist universe Niccol never quite manages to make his own. DenOfGeek: Still an unknown quantity in Hollywood, Andrew Niccol was given around $36m to realise his near-future world, and his use of that relatively slim wedge of cash is almost as ingenious as Vincent’s means of concealing his identity. Rather than hire big name cinematographers, composers, and editors from Hollywood, Niccol selected an eclectic bunch of personnel from the art-house world. Polish cinematographer Slawomir Idziak was best known at the time for his work on Kieslovski films like A Short Film About Killing or Three Colours: Blue. British composer Michael Nyman had previously worked many times with arthouse filmmaker Peter Greenaway. American editor Lisa Zeno Churgin cut together Ben Stiller’s Reality Bites (also starring Ethan Hawke). All of this means that, while Gattaca has the trappings of a sci-fi thriller, it has the dignified tone and pace of a period drama. Niccol’s brave casting choices underline the thoughtful nature of his writing and production; Ethan Hawke was still in his 20s at the time, clearly an actor with talent but by no means a star, while Jude Law had never made a movie in America before. Gattaca’s biggest name, at least at the time, was Uma Thurman, who plays the enigmatic Gattaca worker Irene, while the unusual, witty casting of actors like Alan Arkin, Ernest Borgnine and novelist Gore Vidal (who gives a puckish turn here) are cast for their acting chops rather than their ability to sell cinema tickets. Gattaca at 20: Why it's still one of the best sci-fi movies around. Gattaca alert? Or should we welcome the new age of genetics? Great post! 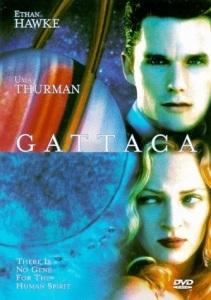 Gattaca is hugely underrated - stylish, poignant, and it has one of the best scores in movie history. And very cleverly named, once you realize it. Kindof a prerequisite to Black Mirror, now that I think of it. Loved it at the time; wonder how it holds up now, 20 years later. I have this real fondness for Nicco's like, middlebrow, mid-century feeling SF stuff. They're all very deliberate old fashioned message movies and that's fine. Even his less good, Justin TImberlake starring metaphor for wealth inequality "In Time" is still pretty good. Guy has a very exact tone and it turns out I'm here for it. I had to write a paper on this movie for high school! Or rather I chose to write about it in History of Science class (the other project was on ...Alien). So I;ve seen it like 12 times. So many lovely details (I assumed the "after dinner mint" Uma takes is actually birth control) and I think likeatoaster is right, the world of clean, tasteful, vaguely euro style feels like the "nice places" in Black Mirror. Also the language over the tannoy is Esperanto, and GORE VIDAL is in it. Also between this and Talented Mr. Ripley Jude Law was really hitting the nail on :stylish retro thrillers where another man committing a crime is in love with him/hates him." The biology is sketchy, but I love the style/imagery and they got the nature/nurture thing mostly right (in the end). I did appreciate the film showing severe economic/genetic inequality and how rules are differentially applied. Sure Hawke, Thurman, and Law were good but I think Arkin is highly under-rated here. But really, in the end, I forgive everything because this film was just so cool, both in imagery and the scientific optimism (and in contrast with the dystopic pessimism). My CSO's (American) accountant actually went to Russia a couple of years ago to get his legs lengthened; it took about 9 months, was excruciatingly painful, he developed a life-threatening bacterial infection, physio took forever... but he's 3-4 inches taller now... and my CSO still managed to get his USA taxes filed in time. I love so much about this movie. I love that line, mce. Gattaca and 13th Floor had more influence on me in young adulthood than is probably healthy. One of the movies that influenced the many lovely first few dates with my now spouse. Also on sale on iTunes this week. Jerome Jerome the metronome. Dr Lamar is da bomb.